For mowing or verticutting and collecting on sports fields. 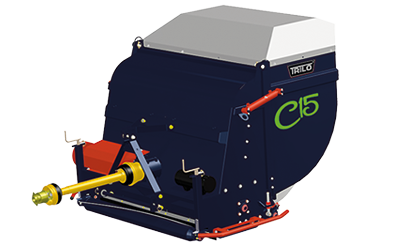 The TRILO C15 is a unique machine, that can flail mow, verticutt AND collect in one pass. This robust machine is suitable for tractors from 30 HP (22 kW) for maintaining sports lawns. The over 1 m3 large hopper can be hydraulically emptied and the shape of the dust cover on top of the hopper guides the airflow to the back instead of upwards. The knives are easily accessible for cleaning, maintenance or changing. Changing knives is possible without using any tools. Besides mowing and vacuuming grass, the powerful axle with wind paddles can also be used to vacuum leaves or, for example, hedge trimmings. • Mowing or verticutting and collecting in one pass. • Collecting leaf waste or hedge trimmings. • Changing knives is possible without tools.